Here the Nothing from gloobic on Vimeo. a beautiful integration of movement, sound, and visual photography juxtaposed atop a semi-aware city. Gloobic is a collaboration by my friend eric gunther (dancer), and jeff lieberman. Visit Gloobic. I definitely look forward to checking it out on my next foray to Barnes and Nobles. In his copious spare time, he's been writing iPhone art apps (photo src: coin-operated.com). July 4th-5th 2009, originally uploaded by anjchang. It was great to see you for July 4th. Glad you had a great time! Happy birthday, the fireworks were wonderful this year. 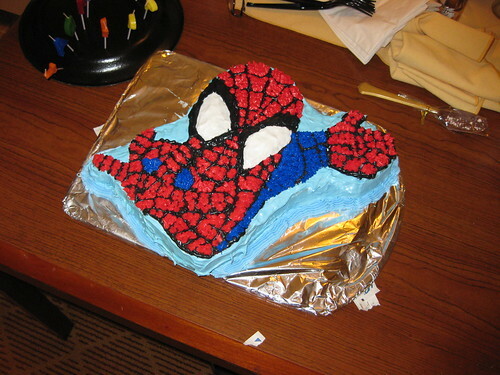 This cake, decorated by Mrs. G, was really spectacular. I am looking forward to finishing the rest of this beautiful cake. Also, welcome to America, Ying! 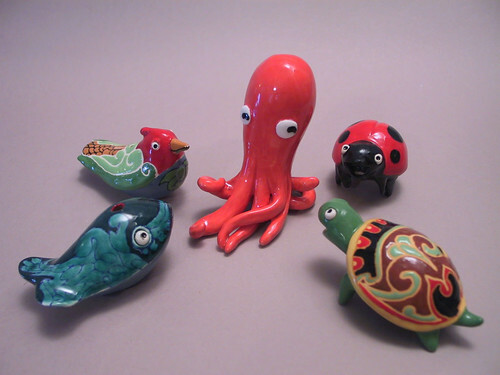 Five Ceramic Animal Whistles, originally uploaded by mmancuso2003. I just ran across Marc's latest whistle creations. The detail on this set is amazing. I really like the soft lines on the whale, and the eyes are just too cute! iF - International Forum Design Hannover: Homepage > iF online exhibition > Entry Details: "Sonos". Wai's design is very clean and elegant, and its an exciting honor. Today, I also got to see Chuck Hoberman talk about transformable design. It was terrific, to think about buildings having animism. I really enjoyed the design language around transformation and building display. The parts that resonated with me most are the emotive aspects of such transformations and the ability of the building to become alive. His aesthetic of simple and clean and manufacturability was another aspect I enjoyed. He showed that with simple units, you can build very compelling structures that were more complex. His favorite piece, which was very delightful, was a spiraling shell. Reminds me of a folding razor I worked on once. It was an inspiring talk and makes you think about the way buildings could have this personality, a relationship with the inhabitants based on it caring for itself. Wonderful talk!